Straight from the ever-expanding Tunaverse, here’s a double header of shows from last year. The first finds the duo traveling down to Raleigh, North Carolina for the “Three Lobed / WXDU Annual Ritual of Sommoning,” the yearly Hopscotch day party that’s become one of the festival’s biggest draws. Next is another duo set from last month at Jeff Conklin’s birthday party. Fun was had by all and here’s the documentation to prove it. While you’re enjoying these live Wet Tuna dispatches, head over to their blog to order Mountain Busted, a 7-CD set of multitracked live shows. I’ve been lost in these recordings for a couple weeks now and the sound is absolutely phenomenal—more than enough reason to dive in head first. 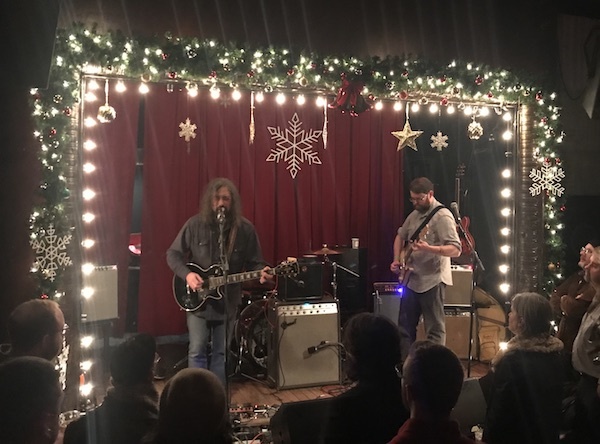 The set gets a little sweeter thanks to a trio of Root Cellar gigs with special guest spots from J Mascis, John Moloney, Jim Bliss, and more, that hail from another plane of existence. I recorded the Union Pool gig from our usual spot at the soundboard, combined with a feed courtesy of Jase Hottenroth. Acidjack recorded the Raleigh show with his usual six track rig at King’s. Both sound excellent. Enjoy! Daniel Bachman’s latest album, The Morning Star, opens with the side-long “Invocation” (wonderfully captured live at Hopscotch back in September) and weaves its way through two LPs worth of solo guitar, drones, field recordings, and found sounds. It’s an expansion of the palette he’s been mining since Orange County Serenade, but here Bachman’s style tips more towards ambient/drone music than he has in the past. However aside from that Hopscotch performance, Bachman is very much still doing solo guitar performances. This set recorded at Trans-Pecos back in August finds Bachman playing “Sycamore City,” “Song For the Setting Sun IV,” and “New Moon” from The Morning Star, plus “The Flower Tree” and “Wine and Peanuts” from his 2016 self-titled LP. He rounds out the originals with a few deep covers you may know: “Beautiful Eyes of Virgina” by Lemuel Turner, “Steamboat Gwine Round Da Bend” by John Fahey, and “Weary Lonesome Blues” by Roy Harvey and Leonard Copeland. 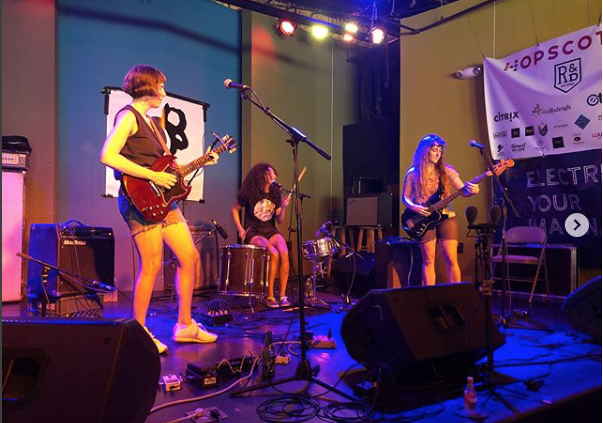 I should possibly apologize to Rosali Middleman, one of the three Long Hots, for referring to her guitar playing as “feral” in last year’s review of this band’s Three Lobed / WXDU show, their third ever. If you’ve heard her other work, particularly her outstanding latest record Trouble Anyway, you wouldn’t necessarily know it was the same person as the one shredding on these scuzz-rock numbers. It was more a statement the style of her guitar playing for this band than the, you know, quality. But I digress. A year later, Long Hots continue to be one of Philadelphia’s best up and coming exports. The band’s gritty, garage-style approach recalls Philly brethren Spacin’ and Purling Hiss, and like those bands, the Long Hots can make it feel like a 3 a.m. rager in some hopped-up dirtball’s basement even if they’re actually playing a day show in a much-nicer-than-average local club. This five-song set almost doubled last year’s set in length and at least matched it in intensity, showing us new songs that (one day?) could fill out a full LP. As for now, Long Hots remain “Philadelphia’s most anticipated band” in that respect, as they continue to hone their live chops. You can catch another flavor of that on the band’s sole release, the Monday Night Raw cassette, which is exactly what it sounds like. I recorded this set with a blend of onstage Schoeps microphones, a pair of mics in the audience, and a soundboard feed. It’s a fun recording. Enjoy! 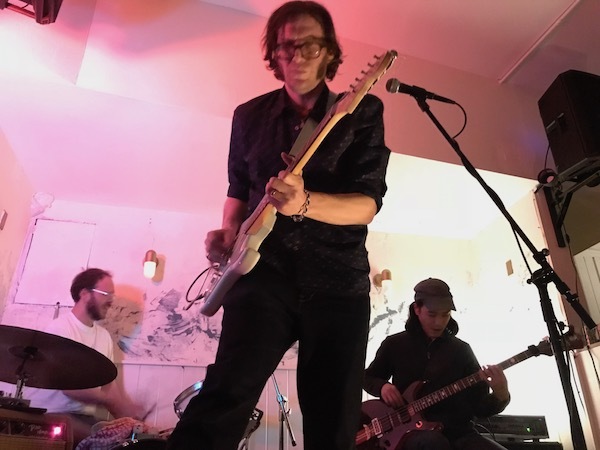 Here’s a wild one from New York’s masters of improvised psych, Rhyton, opening up for fellow heads Wet Tuna at Wonders of Nature. This set captures the trio—Dave Shuford, Jimy SeiTang, and Rob Smith—in full-on improvisational mode. The direction on these jams tends more to their recent easy-going Redshift material, which just so happens to be my favorite side of Rhyton. While their earlier, heavier stuff first caught my attention, it’s Redshift that I pull out most frequently when searching for the sound. In particular, it’s the set-ending and mind-bending closer of “The Owl’s Octave” into “Pharaonic Crosstalk” that scratches that itch for exploratory rock thats meanders and grooves. Rhyt-on! If Williamsburg venue Union Pool is better-known among the GenZ semi-grownups that populate the nabe’s bars these days, don’t tell the people who crowded the room for the Bardo Pond show on this snowy Saturday night — many of us grinning as the hookup-seeking set turned away from door not only by the “SOLD OUT” sign but also the deep noise emanating from behind it. Bardo Pond is one of those bands that will always cast a deep but not wide net, nestling in the psyche of those able and open to embracing them. Their massive oeuvre — their latest and misleadingly titled Volume 8 is far from only their 8th record — attests to fans’ insatiable desire for what they’re into. Tonight’s set, short on number of songs but long on jams, was anchored by a sprawler from the new album, “And I Will” along with some recent tour favorites. The night capped with a longtime band classic, “Tommy Gun Angel,” putting an exclamation point on the idea that whatever other fleeting things might pass on that Saturday night in that room, this band always leaves echoes long after they’ve left the building. I recorded this set with Lesley’s house PA feed together with Schoeps MK5 cardiod microphones. The sound is excellent. Enjoy! Until the surprise announcement of Bay Head from Gunn-Truscinski Duo last year, it seemed like these guys may never put out another record together. Their last platter, Ocean Parkway, was released back in 2012 and besides a very special gig for the Three Lobed Sweet Sixteen, the pair had been awfully quiet for a long time. 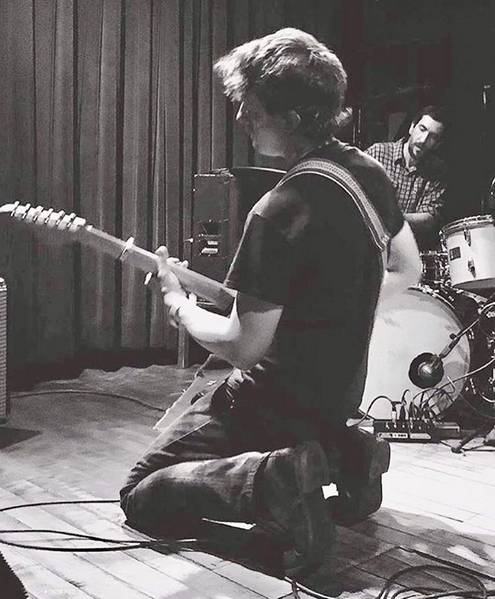 Fortunately for us Bay Head picks up right where they left off, proving that when Steve Gunn and John Truscinski get a room together, it’s a rare magic that results. And speaking of rare, the duo aren’t doing many shows together in support of the record, but we were lucky enough to capture this set from Union Pool last week. Old classics “Bahn Mi Ringtones” and “Ocean Parkway” brought back memories of Zebulon gigs past, while new songs “Sugar,” “Seagulls for Chuck Berry,” and “Gunter” were captivatingly fresh. If you’re in LA, be sure to grab tickets for their show with Body/Head. And if you’re in Brooklyn, Union Pool has another free show scheduled for this Tuesday, Jan. 16, with the inimitable Sir Richard Bishop headlining. I recorded this from our usual spot with MBHOs combined with a board feed courtesy of FOH Doug. The sound is terrific. Enjoy! It’s an article of faith that artists who are friends of Three Lobed Recordings always bring their best for the label’s annual Hopscotch day show showcase, co-sponsored with Durham’s WXDU. Nathan Bowles, a multi-year veteran of the event, outdid himself this year, choosing to use this platform to debut his new trio with Casey Toll on double bass and Rex McMurry on drums. Although this was the trio’s very first show, you wouldn’t necessarily have known it, as Bowles and the new band added new heft to what were originally his solo songs (“Blank Range”) as well as coming out strong with new ones (one untitled, one known as “Freshfaced”). Bowles’ current music has already redefined and expanded the notion of modern banjo music, but the trio promises to push things even further, offering the opportunity to head in directions he hasn’t yet contemplated in other groups in which he participates, such as the Black Twig Pickers. For one, these songs feel a bit more like rock songs, with McMurry’s drumming pushing a faster tempo and an overall heavier direction, particularly on the new song. “Freshfaced.” Seeing Nathan Bowles is always a treat — and it’s something we do as often as we can — and this trio only adds to the anticipation of what he’s up to next. Bowles has a few shows around the southern U.S. this month, so go have a listen if you can. I recorded this set with Evan Lamb’s house mix, plus an additional soundboard feed of the banjo, together wtih Schoeps MK4V microphones onstage, and AKG 460 cardiod mics hung over the audience. The sound quality is excellent. Enjoy! 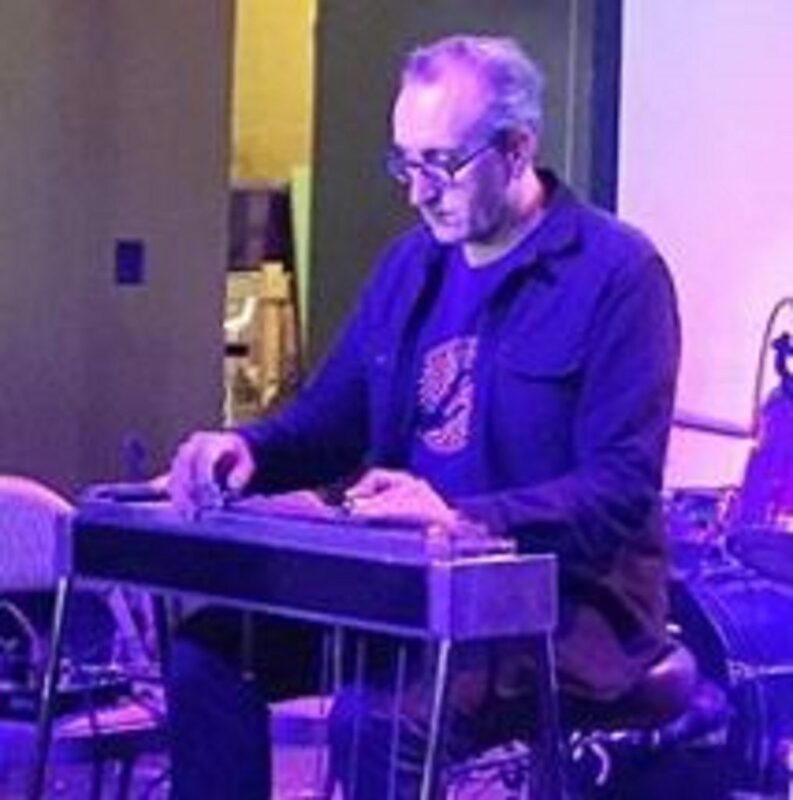 As a multitalented musician — a soundtrack composer, rock guitarist, and solo guitarist, among other things — it was nonetheless an exciting turn when the Bay Area (by way of NC) artist Chuck Johnson released Balsams, an album of pedal steel compositions that invented what Pitchfork rightly deemed a new genre unto itself: “country post-rock.” This being the annual Three Lobed Recordings / WXDU Hopscotch Afternoon Jamboree at King’s in Raleigh, NC, Johnson did the only-partly-expected, playing a Balsams track, “Riga Black,” but reworking the original into an extended ambient meditation. There’s an undeniable grace and peace to the work that melded perfectly with the afternoon’s inclusive, forward-looking vibe. We never miss a chance to see Chuck in action, and Balsams is yet another evolution the career of a gifted and visionary artist. I recorded this set with Schoeps MK4V microphones onstage plus a soundboard feed of Evan Lamb’s house mix. The sound quality is outstanding! Note: If you purchased an earlier version (before 10/1/2017) of this from bandcamp, go back and snag this version, as it has been re-mastered to remove some glitches from the original. Chuck performs at the Ambient Church in Brooklyn this Friday with Windy & Carl. Check it out. 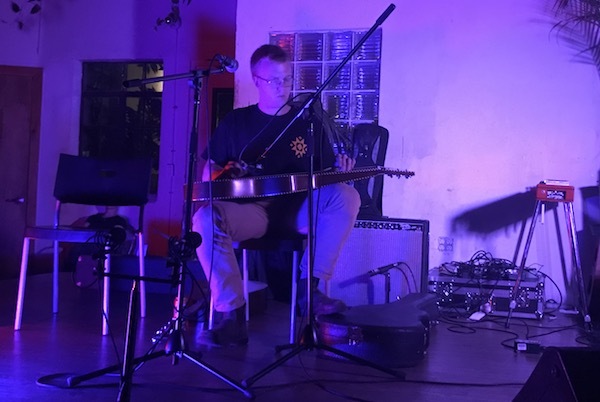 Tashi Dorji and James “Wooden Wand” Toth are both favorites of ours, each having performed some spectacular sets of music that we’ve featured in the past (and more to come). Dorji is a modern day avant-guitar master, while Toth — best known for his Wooden Wand songwriting — can move fluidly through several genres, as comfortable in singer-songwriter mode as he is with the way out. This Three Lobed Recordings / WXDU Hopscotch day show set featured the two men doing more of the latter, as the two men wove together a one-of-a-kind ambient noise improvisation. The mysterious box you see Toth in front of in the picture is the Octatone, a rare, handmade instrument by Forrest Marquisee of Virginia-based Forest Floor Studios, which you can learn more about here (watch a YouTube demo here). You can’t have one of these legendary day shows without a spiritual out performance, and this collaboration was that highlight for us this year. The connection between these players was such that this creation didn’t even start with a roadmap; what you hear is the organic evolution of two music minds in the act of creation. It’s a special moment not to be repeated, and it’s part of why I never miss a Friday at King’s in the early weeks of September. I recorded this set with Evan Lamb’s house mix plus Schoeps MK4V microphones onstage. The sound quality is outstanding. Enjoy! Tashi and James play at Black Iris in Richmond on October 21. Check it out if you’re in the area!